Don’t Settle For Any Old Alarm Clock When DormCo Has Tons Of Cool Clocks! You’ll quickly find yourself in a love/hate relationship with your alarm clock when you enter college. No, you’ll never really get used to it waking you up in the morning for class or waking you from a nice, deep nap. It will however help you tell the time—which is always helpful—and can serve as a quick reminder for all sorts of things. You’d be surprised how easy it is to actually go to a test when you’re sitting in your dorm room studying last-minute. So far the alarm has been demonstrated as a wake-up device and test reminder. So where’s the love part of the relationship? Well, with DormCo’s cool collection of alarm clocks, you’re bound to find one you love, be it the coolest alarm clock you’ve ever seen or even the most practical. Here’s a sampling below. 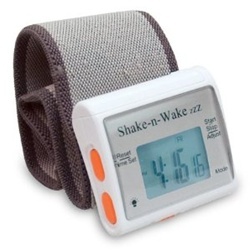 The Shake N Wake alarm clock is one innovative dorm item! In short, it gently shakes when the alarm goes off as opposed to the loud, annoying, mechanical beep that you’re probably used to. Not only does this function wake you up much more gently, it’s plenty useful for when you don’t want to disturb your roommate or are napping in the library. What’s that? You’re wondering why you’d have reason to nap in the library? Clearly you haven’t yet lived through a Finals Week in college yet. There’s really only one super cool feature about this water-powered alarm clock, but that feature is quite awesome. You guessed it! It’s water-powered. Just pour in some water to the Digital Water Powered Alarm Clock and you’re all set to go. Most alarm clocks are quite efficient energy-wise, and they don’t require changing batteries too often. But when they do, it’s just another annoyance and expense that you won’t need to worry about if your alarm clock is powered by water! Keep in mind too that it’s a collection of unique dorm items and cool dorm stuff that will make your dorm room the dorm room on your floor that makes all your dorm mates jealous. Now here’s an alarm clock for college that’ll guarantee you’ll be up and out of bed! The Clocky not only plays music, whirs, and makes a whole racket when it goes off, it also rolls around the floor. Prop it right on your nightstand or bedside shelf and it’ll be ready to roll when it goes off. The wheels next to it are big, so it can take the impact if it rolls off your bed (It can sustain falls up to 3 feet). We know it takes quite a bit of motivation to get you out of bed for early classes, so try a dorm alarm clock that will leave you no choice but to hop out of bed. It’s quite the way to wake up in the morning. You’ll definitely recognize the Melting Clock from the famous Salvador Dali painting “The Persistence of Memory.” As iconic as that painting is, don’t worry about being an art major or lover of Spanish Art to have to add this clock to your dorm decor. Yes it's a fully functional clock even though it’s bent. While Dali’s painting expressed the idea that time could be subjective, don’t think you can use this clock as an excuse to be late to class! Even an art history professor wouldn't take that excuse!